Well, since I’m new to both the whole online crafting scene and to blogging, it seems that a good place to begin blogging is to simply just post a few cards. Simple enough, right? Not too scary . . . . 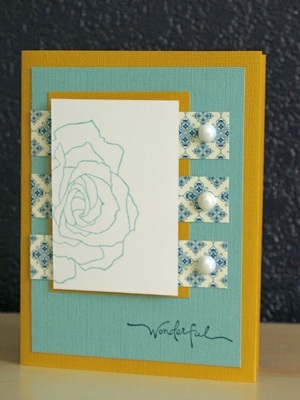 I created this Rose Thank-You Card based on the Taylored Expressions Cupcake Challenge #48. Though Taylor actually issued this challenge a few months back (Christmas 2008), I wasn’t really following crafting blogs at the time, and missed out. I’ve had a great time back-tracking and using all of the amazing sketches from challenges that have already closed. I just adore the wonderful balance that Taylor builds into her card designs! Alrighty, now for a little bit about this particular card. I really wanted to do something unique with Stampin’ Up!’s new Fifth Avenue Floral set, and as all of the cards I’ve seen so far using this set have featured multiple flowers, the obvious way to go was to just use the rose image. I stamped it coming up from the bottom of the card stock — almost as if it’s reaching toward the sky! I used Stampin’ Up! Baja Breeze textured card stock for my “sky” color (just a strip, coordinating with the cute button), and made the base of my card using Bazzill Basics card stock in Desert Sun. I am so in love with this color, I could just cry! I was thrilled to find that Andrea Victoria had created some digital paper in this happy color — I’ve used it as my background for the blog! The amazing Moroccan pattern comes from Stampin’ Up!’s Azure Designer Series paper pack, which is now discontinued. (Grrr!) Then, I used one of my favorite scripty stamps from Stampin’ Up!’s Short & Sweet set for the sentiment. Now, time to ‘fess up. Do you see the mistake I made on this card? Yup — the piece of card stock with the sentiment is way too tall for the button! But I stuck it down with a few Mini Glue Dots to make sure that it kept the wave, and didn’t notice it wasn’t the right size until the button was down and they didn’t line up. (Freaking Mini Glue Dots! Love them and hate them.) Although it’s bugging the crap out of me, I decided it’s best just to let it go. It’s, you know, good for me. Or something. The Wonderful Card is based on another Taylored Expressions Cupcake Challenge: number 51. I loved that I was able to get another beautiful look out of the same basic elements! This time, the sentiment is from Stampin’ Up!’s Warm Words set, and I brought in the rose image from the side to balance out the design. Plus, when the rose is sideways like that, I can imagine someone holding it out to a friend, which works nicely with the “Wonderful” sentiment, I think. This card works for me on so many levels. Pearls are one of my favorite embellishments right now, and I can’t believe it took me a couple of years to really discover them for cards. They’re so elegant and timeless; they dress up any outfit! Why would it be any different for cards, right? I love the way they enhance the elegance of the Moroccan print paper! More “past challenge” cards tomorrow! 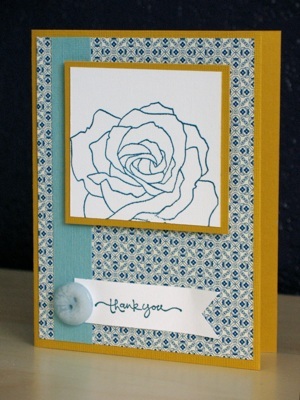 rose thank-you card recipe: cardstock: bazzill basics paper and stampin' up! ; patterned paper, stamps, ink, and buttons: stampin' up! wonderful card recipe: cardstock: bazzill basics paper and stampin' up! ; patterned paper, stamps, ink, and pearls: stampin' up!